Labeled the most innovative city of the world in 2012 – Medellin has been drawing more attention to tourists, backpackers, digital nomads, big name businesses and more! Medellin belongs to the Antioquia Department and serves as its capital. However, the city is not as big as the country’s capital, Bogota, but it has plenty to offer. Quick two reasons why travelers come to visit Medellin and often end up calling it home: the weather and the people. Perhaps that is why you are visiting? Now that you are here, you are probably thinking to yourself: “What is there to do?”. No need to worry because in this post we will cover our best things to do in Medellin. 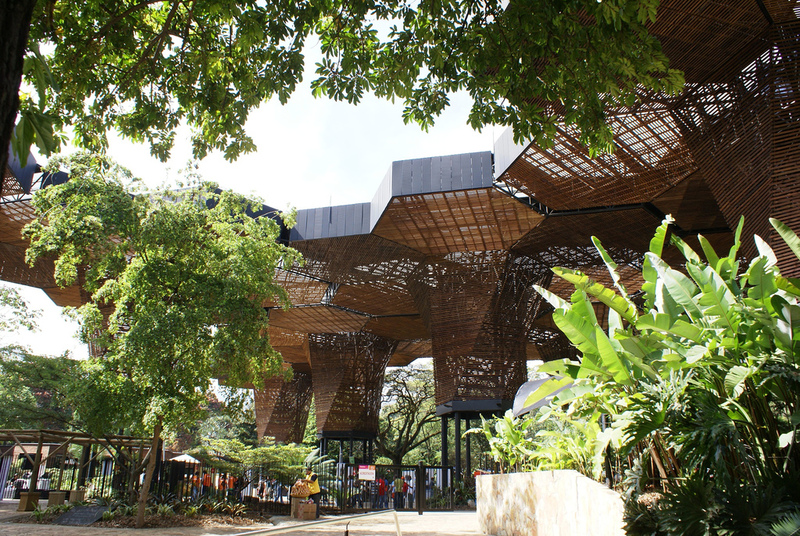 First on our list of best things to do in Medellin is visiting the botanical garden, or “Jardin Botanico”, which is located next to Parque Explora and the University of Antioquia. The park is filled with exotic flowers and home to various animals such as flamingos, other birds, butterflies, turtles, and corgi-sized iguanas that roam the gardens. Don’t worry, the iguanas are harmless. The best part about the botanical gardens is that it is completely free to enter. Jardin Botanico is also a great spot to take a date. The open grass areas, beautiful flowers nearby, and chirping birds make the perfect setting for a picnic during the day. There is also a restaurant inside the garden called In Suti; where you and that special someone can enjoy a romantic evening. The plates average around $35.0000 COP. Getting to Jardin Botanico is very easy. One way is going by taxi or Uber. Any cab driver will know where it is. Another method of getting there is by metro. You can hop off at the University metro station and you will immediately see the entrance. Parque de los Deseos: An outside public space that attracts many people. Sometimes movies are shown there on a big projector screen. Parque Explora: Medellin’s aquarium and interactive museum of Science and Technology. Parque Norte: Medellin’s amusement park with roller coasters, games, food stands, and other attractions. 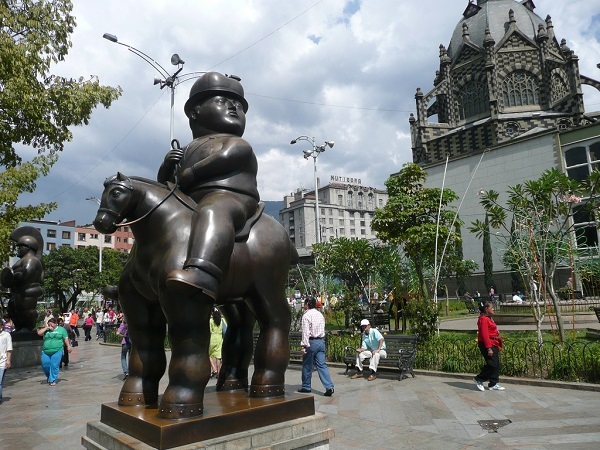 In El Centro (downtown) of Medellin are 23 giant statues created by the famous Fernando Botero Angulo. Take the time to snap some pictures with over-sized statues. The Plaza Botero can get very crowded with both, locals and tourists. Next to the statues is the Museo de Antioquia. The museum entrance is free and inside you can see the rest of Botero’s work, including the work of other famous Colombian artists. Getting to the Plaza Botero is very simple. The easiest way to get there is by metro. Get off at the Parque Berrio Metro station and you will walk right into the plaza. In between the high apartment buildings of El Poblado lies a beautiful European-Gothic castle. It is just a short cab ride away from Parque lleras. You will not believe how many Paisas are unaware that this beautiful castle exists in their city. 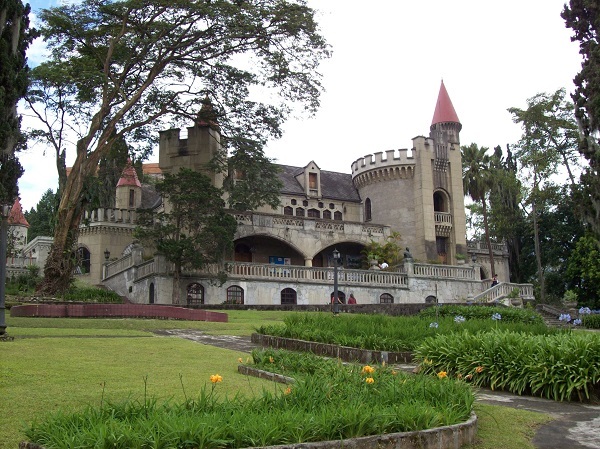 The castle was constructed in 1930 by H.M Rodriguez and was Medellin’s first firm construction. Inside el castillo lived Diego Echavarria Misas and his family. The Echavarria family decided to expand the castle walls, add more decor to later donate the castle as a museum. Today, the Castle is open 7 days a week to the public and offers a museum tour where you may visit the rooms of the family (still furnished from the 1940’s) and learn more about the Echavarria family. The tour will cost you around $10.000 COP and you are more than welcome to hang out afterwards and even have a picnic. Now visiting the El Castillo is a great activity to do in Medellin, and much like botanical garden, it is another place for a romantic date. 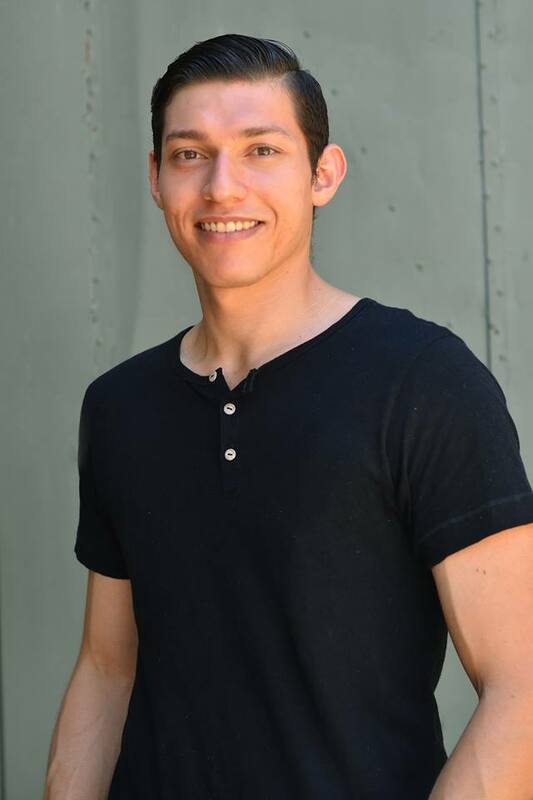 Adding more to the date idea – I took my girlfriend for the tour, plus a picnic in the grass with wine and dessert for Dia del Amor y Amistad (Colombia’s Valentine’s day, September 16th). She was absolutely blown away. So, if you want to be more romantic with the your boyfriend or girlfriend, then definitely take them to el Museo Castillo. Stores on stores on stores! 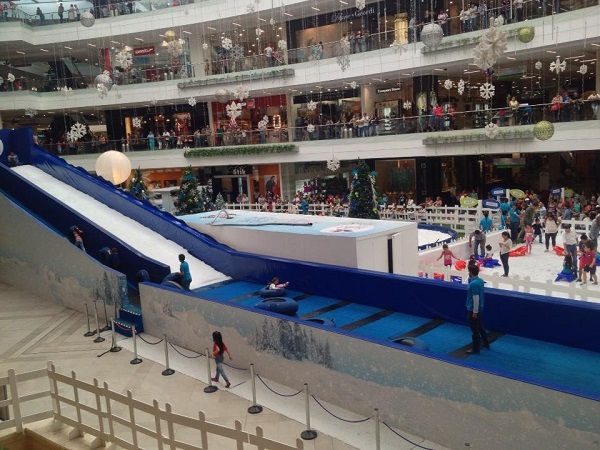 A fun activity to do in Medellin is visiting one of the many (if not all) shopping malls. The bigger centro comerciales (shopping malls) consist of many designer brand shops, boutique shops, cafes, restaurants, casinos (yes casinos! ), bars, movie theaters and more! The largest shopping mall in Medellin is the Centro Comercial Santa Fe. The mall has five floors with so much to see. Be sure to check these malls out during December, as they go all out with Christmas decorations and setup attractions such as ice rinks, snowman building stations for kids, meet & greet with Santa Claus, and much more! This wouldn’t be a proper to do list of things to do in Medellin without explaining the nightlife. The two main places to visit Medellin’s nightlife are Parque Lleras (El Poblado area) and La 70 (Estadio area). Should your Airbnb, hotel, or hostel be in El Poblado, then you are already in the heart of the nightlife. Parque Lleras, or Lleras Park, which is infested with restaurants, liquor shops, and dance clubs. Lleras is usually everyone’s go to spot to get their salsa dancing on. Not a big salsa dancer? No worries. 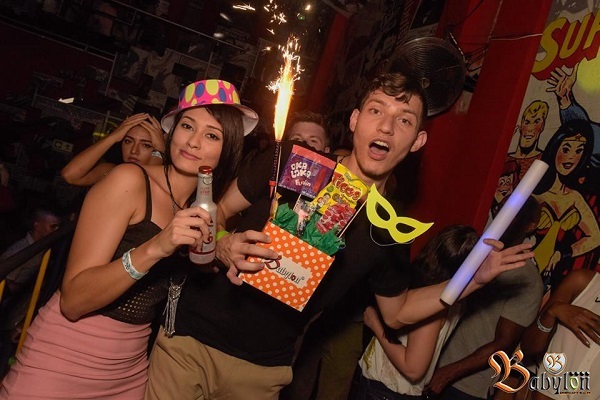 Most of the dance clubs in Medellin, if not all Colombia, play what is called crossover: a mix of music that consist of Salsa, Reggaeton, Vallenato, Electronica, Bachata, and sometimes Hip-Hop. Medellin is still an up and coming Latin American city. The tourism industry here is booming with new travelers checking in every day. Our list will continue to grow s the city improves and innovates itself. Spend a month or a few here and see for yourself why everyone else is talking about Medellin!